By now, you know a thing or two about contouring. In fact, concepts like contouring, highlighting, and strobing have become part of your regular beauty vernacular, thanks to a small, barely known family with razor-sharp cheekbones. Just kidding: It’s the Kardashians. And we’ve kept up with all of their beauty moves over the last decade. But as of late, there has been a noticeable shift in the beauty sphere—designers have called for a less-is-more look to send down the runway, and women seem to be tired of all the fussiness that comes along with a massive makeup routine. Enter: striping. It’s the latest craze in cheekbone-defining beauty techniques that looks more like an easy sun-kissed glow than a 45-minute endeavor. “Striping is the new strobing. It is a new way of applying bronzer in a more authentic way that looks super natural, fresher, and cooler,” Monika Blunder of highbrow.com wrote in an email. “I’m game,” I thought, flipping through reference images of bronzed (but not too bronzed) models. So, while contouring sculpts the face, striping creates a more authentic glow that looks really natural, like you spent a day in the sun. It’s great for times when you don’t have time to do a full contour (or if you’re just over it completely) but still want to give your skin a gorgeous flush. Keep reading for the quick four-step process to sculpted skin. Prep skin with your foundation or tinted moisturizer of choice. Smashbox Camera Ready BB Water ($42), It Cosmetics Your Skin But Better CC Cream ($38), and Nars Velvet Matte Skin Tint ($44) yield really natural-looking results. Apply the product with a buffing brush—it blends really well into the skin—for an airbrushed finish. 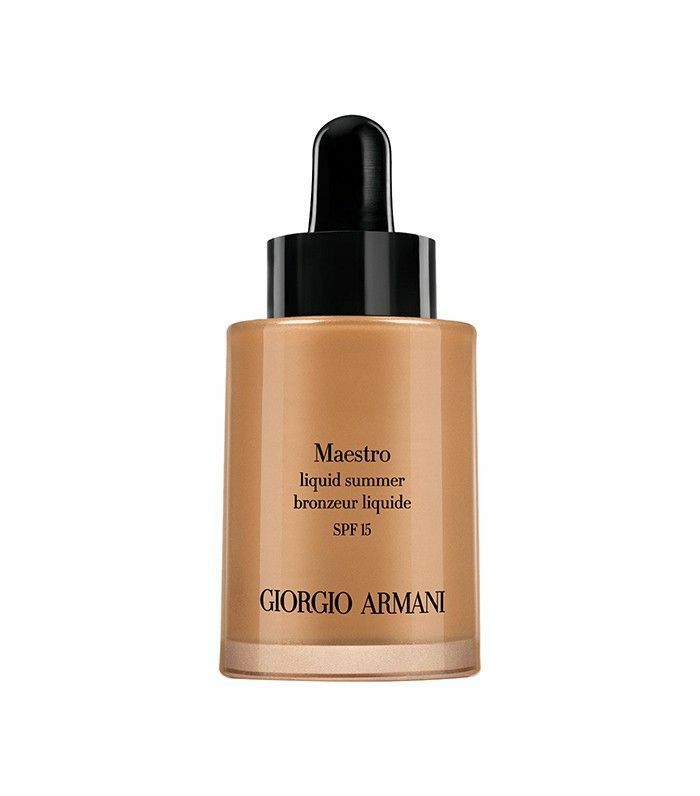 Using a flat, synthetic Kabuki brush, buff a cream or liquid bronzer, like Chanel Soleil Tan de Chanel Bronzing Makeup Base ($50) or Giorgio Armani Liquid Summer ($64), across the cheeks and nose—where the sun naturally hits your face. A cream-based product is best used with a synthetic brush because a natural brush will absorb the cream and easily stain. 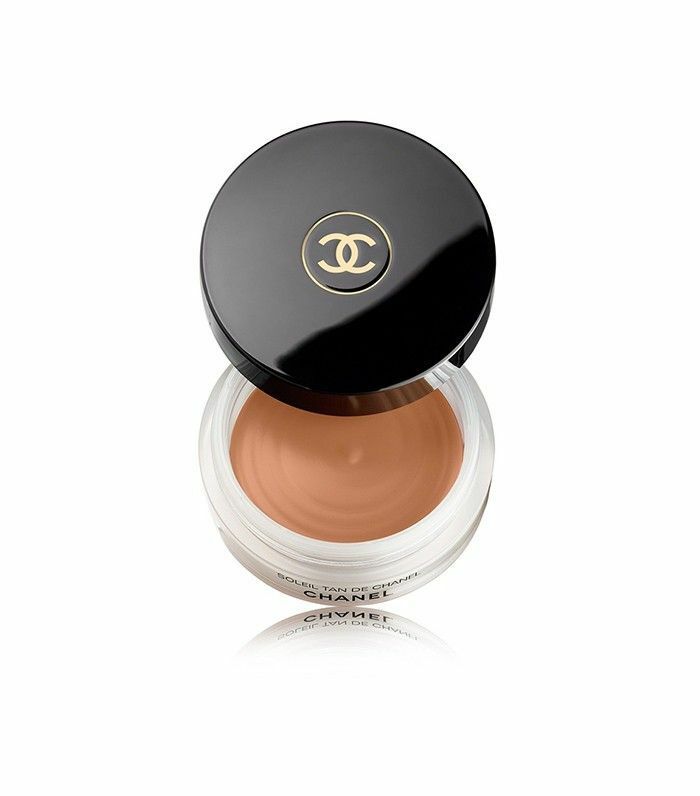 Liquids and creams give the most realistic finish and really allow skin to show through, but if your skin is oily, opt for a powder, which has a similar effect and won’t melt off your skin (Chanel Les Beiges Healthy Glow Sheer Powder, $58). Use a fluffy powder brush (Charlotte Tilbury Bronzing Brush, $85) because it won't pick up too much product. For the most natural-looking results, avoid using a bronzer with shimmer. Start the product at the highest, roundest part of your cheek on one side, and continue blending the product in a straight line over the nose and onto the other cheek. Blush isn’t required, but it can be a great addition to make the “stripe” look more realistic. Make sure to thoroughly blend the product so the stripe gradually fades outward, with the most color concentrated in the middle of the stripe. Use a damp Beautyblender ($20), it will give the whole look a really natural, glowy finish. Now that you’ve mastered this new technique, click over for 12 (inexpensive) tricks from Beyoncé's makeup artist.